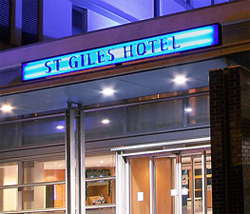 Based in the St Giles Hotel, Feltham we are located opposite Feltham Mainline Overground Train Station. Our website offers the facility for you to book your vehicle rental online - We rent a wide range of new cars from small and economical Ford Fiesta's to large Vauxhall Vectras and the VW Touran 7 Seater. Should you have any queries, don't hesitate to call us.